Have you been involved in a cycling or bike accident that wasn’t your fault? We can help you bring a claim for personal injury as well as other losses such as loss of earnings and damage to property. We are experts at handling cycling & bike accident claims. At DSM Legal Solicitors your cycling or bike accident claim will be handled by a fully-qualified solicitor who is an expert in their field. You will be given full support throughout your claim and we promise to make the process as stress-free as possible. We can help you receive the best possible compensation award together with any rehabilitation support that is recommended. Our personal injury solicitors operate on a ‘no win, no fee’ basis. Speak to one of our solicitors on 01925 937070 to start your cycle accident claim or complete our Personal Injury Claims Form. 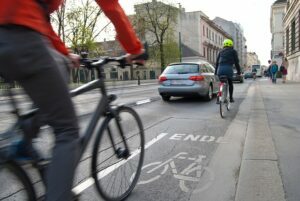 Make a bicycle cycle injury claim with DSM Legal Solicitors is simple. We can help with everything – whether it has been recommended that you need physiotherapy to recover from your injuries or you need financial advice due to your accident, we have access to a team of expert services that can help you. Free onsite car parking and disabled facilities including lift and disabled toilets. Our office in Warrington, Cheshire is minutes away from junction 8 of the M62. We are based in Warrington, Cheshire and we have helped clients from across England and Wales. We can assist with personal injury (accident claims), serious injury claims including fatality claims, road traffic accident claims, accidents at work, medical negligence claims, lasting powers of attorney, wills and probate, oaths, affidavits and statutory declarations, criminal injury compensation claims, employment law claims, settlement agreements and professional negligence claims. Click here to complete our Cycling Accident Claims Form or telephone 01925 937070 to speak to a solicitor in confidence today. If you have been injured in an accident that was not your fault, contact DSM Legal Solicitors as soon as possible to discuss a potential bike or cycling accident compensation claim. For an assessment of your personal injury claim, complete our online enquiry form or call us today on 01925 937070. You can click here and complete our Personal Injury Claims Form. You can also visit our personal injury page for more information and useful downloads.